I am often asked, “Why should my child take private lessons?” Here are my thoughts. I've been performing and recording with the Rose City Trombones, here are my key takeaways. About a year ago, my friend Thomas Helton had the idea to put together a group that specialized in early/New Orleans/hot/trad jazz* and featured trumpet, clarinet, trombone, guitar, banjo, and tuba. The concept was a fresh one for Houston (in that it was 100 years behind the times) and instantly appealed to me. Why? Because it would rely on the chemistry of playing together in various roles instead of playing over one another. Academically, this is referred to as "collective improvisation", an approach that was pioneered and popularized in New Orleans at the turn of the 20th century. Today, the landscape of collectively improvising groups has dwindled down to practically none at all but you can still find traditional and interesting new examples if you look deep enough. Popular music has moved on from this practice, for better or worse, and so it's considered archaic in certain contemporary jazz circles. There's more to it, of course, but my time playing with Boomtown Brass Band was a fantastic musical experience. The challenge of spontaneously creating group chemistry is much harder than it first seems, and it was always a great feeling to pull it off! * I refuse to call it "Dixieland jazz" because 1) We're not from Chicago and 2) I hate that stupid name. My new jam is called "Idol Gossip"
For the past year or so, I've been making "cool" jazz sounds with a group called Idol Gossip. And I'm so happy to tell you about it now, because it only took that long to settle on a name! We based the group on the Gerry Mulligan piano-less quartets of the 1950s and 60s, performing our own arrangements as well as classic material. Visit our Facebook page or check my calendar for upcoming performance dates, like our standing monthly appearances at MKT Bar and The Flat in Montrose. 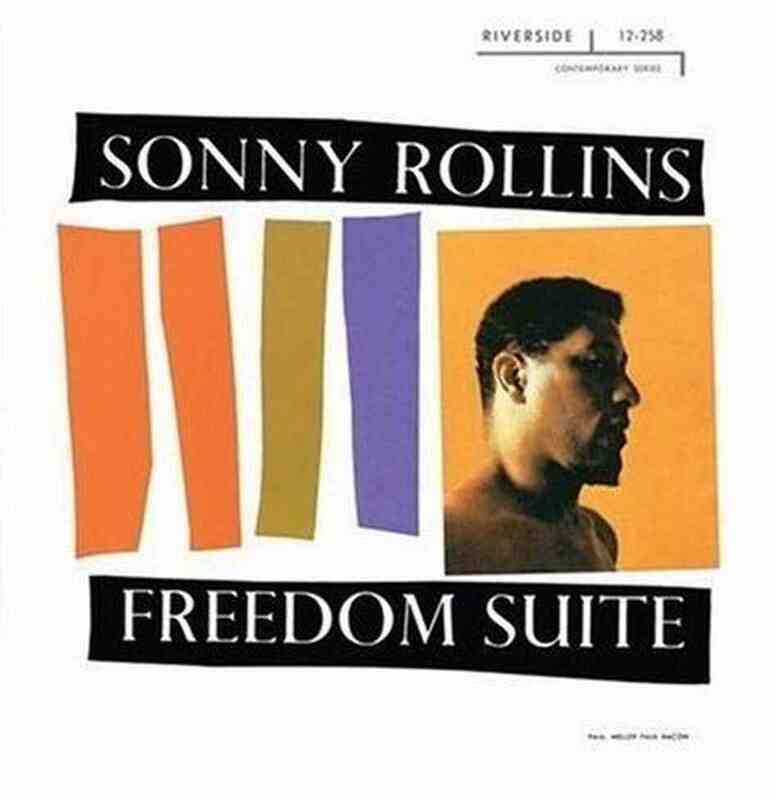 Sonny Rollins "The Freedom Suite"
I transcribed this in a weekend earlier this year as a favor to a friend for a performance. Honestly, I was very unfamiliar with it prior to his approaching me for the transcription job. One thing that struck me was how conventional it sounds for 1958. Between Sonny, Oscar Pettiford and Max Roach, they play it all pretty straight. It's a melodic series of improvisations and Pettiford's presence (I feel) helps to keep it tightly confined and on track. There's very little stretching out, harmonically speaking, on this chord-less trio date which may strike many listeners by surprise, as it did me. This is what a lifetime of studying John Coltrane will do to your perspective if you aren't careful. We are chronologically removed from the outgrowth of Coltrane's massive harmonic risks so that something like "Freedom Suite" sounds tame by comparison. It's impossible to compare Coltrane's 1960s works (which often featured piano-less trio) to this. I was refreshed to find a great recording full of the many melodic links and themes that Rollins so well-known for, so I highly recommend it. Throughout the entire 19-minute suite, however, I find myself listening to the drums more closely each time. Roach's melodic playing make this recording special with his weaving of time and interesting rhythms guided by a concentration on the melody above all. I've put my transcription here for all to enjoy, study and (hopefully) perform in the interest of keeping these experiments alive and well. I did enjoy a (very slight) hint of the famous "Giant Steps" chord progression in the opening improvisation section. While this pre-dates Coltrane's eponymous album by a year, it's interesting to hear the device as a neat little bebop trick before Coltrane expanded it so dramatically.